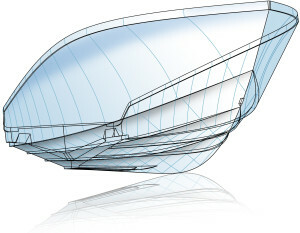 What exactly is the correct definition of a true center-console-boat? Center console (British English: centre console) is a type of single-decked open hull boat where the console of the boat is in the center of the boat. There is a cabin on some models; these cabins are usually located in the bow and hold small berths for sleeping. The boat deck surrounds the console so that a person can walk all around the boat from stern to bow with ease. The console of a boat is where all the controls are located, including steering, ignition, trim control, radio and other electronic devices, switches etc. It may have a small storage space and/or a head. In general there is no weather protection or berths, making the design ill-suited to cruising. The console may have a T-Top cover to provide limited relief from the sun and rain, but this is not universal because it interferes with fishermen’s casting. Most center consoles are powered byoutboard motors. A center console boat is popular as a small boat on a large ship. Center console boats may range in length from 13 feet to about 53 feet.